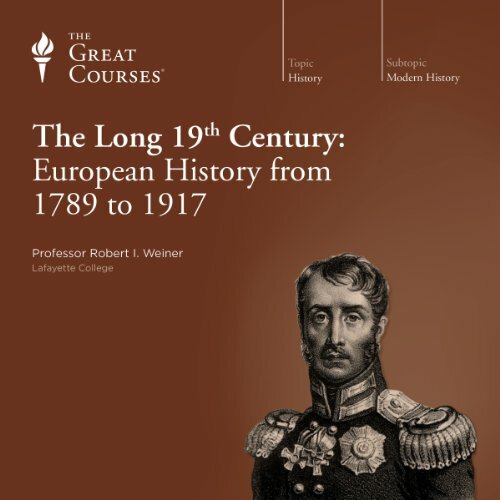 Over the course of 36 engaging lectures Professor Weiner leads you on a spirited journey across an ever-changing European landscape, examining the forces and personalities that reshaped the continent's physical borders, diplomatic relationships, and balance of power. Assuming no prior knowledge of this era and no professional vocabulary, he explores this turbulent and important era with interest, curiosity, and passion. You'll look at what the transition to modernity meant for peasants, workers, the middle class, aristocrats, women, and minorities. And you'll consider the political and diplomatic moves of the great powers - Great Britain, France, Germany, Austria-Hungary, Russia, and Italy - in the context of the deeper economic, social, and cultural forces at work and how they reflect the impact of some of history's most significant names, including Napoleon Bonaparte, Otto von Bismarck, and Kaiser Wilhelm II. With this ambitious look at the evolution of the environment that ultimately made World War I possible, Professor Weiner explores more than factual history - the dates, battles, and treaties. He repeatedly steps back from on-the-ground events to clarify historical trends or patterns, providing a comprehensive look at this engaging era. I've never yet listened to a production by "The Great Courses" that wasn't worthwhile, and "The Long 19th Century" is no exception. Prof. Weiner is both knowledgeable and engaging, with an obvious love for his subject. In particular, I found the final lectures, with their ties to WWI and to the "short" 20th Century which followed, to be the most interesting and rewarding. My major complaint about this series is that, unlike the other Great Courses offerings I've listened to previously (and I've probably listened to a couple dozen), Prof. Weiner refers extensively to the suggested reading in the course guide. course guides aren't typically included GC downloads on Audible. Typically, the course guides are a nice compliment to the recorded material, but aren't an integral part of the course. While I don't think they were 'integral' in this lecture by any means, I did feel that the lecture was created with the assumption that readers would read the suggested texts (much as an undergraduate would), which puts the Audible listener at a disadvantage. This is a quality product, and for anyone seeking a broad overview and thematic analysis of an important but poorly-remembered period in European history, this is probably a great place to start. But for those encountering the Great Courses series for the first time, I'd advise picking a different title. I thoroughly enjoyed this lecture series. Although this course had its fair share of specific dates and events, the context and overview of the time period made them relevant and easier to comprehend. The19th century was a pivotal and complex time and Europe was the most powerful and volatile continent. A lot happened. Professor Weiner is a master of the topic. He offers great insights into the trends of humanity, the effects of the events that shaped 19th century Europe and its impact on the 20th century and beyond. I had a difficult time keeping track of all the political and social systems that came into play during this century because many were launched and tried during this tumultuous time. If I were to follow the book recommendations of the professor I'm sure I'd have a clearer understanding of 19th century liberalism, early anarchism and socialism - to name a familiar few. This was my first experience with the "Great Courses" lecture series and I can only hope that my next one will be as informative and fulfilling. I have sat through countless hours of classroom lecture on the subject of WWI. I have read the best books and discussed this time period many times in the last few decades of my family and professional life. I have never heard a more precise and believable account of the proximate causes of that wars breakout in 1914 than this. If for no other reason than to gain an understanding of how the tragedy of WWI could occur, listen. The positives: the professor is passionate about his subject. Many of his lectures were quite moving - I was especially stirred by the discussion of the lead up and experience of the Great War. This is a fascinating period and I knew very little about it. He certainly whetted my appetite to know more. I appreciated learning about something I had really missed in school, despite being a history major. It was a confusing period of history as well. What I didn't like: The lectures were more like an undergrad course, where he assumed I had done the background reading, and was riffing on themes that pervaded the time, rather than any recitation of what actually happened. Because of my lack of background, I was often confused, as was my 18 year old son who also listened. Other Great Courses titles are better about weaving through the facts so that the novice can follow. Even if you are a history nut (as we are), I wouldn't start with this GC, or at least realize that this is not how they are all presented. I'm listening now to Fagan on Ancient Rome, and Desan on the French Revolution, and both are doing a better job of making it understandable to the novice. 1. The professor structured the lectures more as commentaries than lessons, making it much more important to read the recommended source materials. The problem with this approach is that I listen to Great Courses precisely because I do not have time to read the source materials. While I appreciate the Great Courses providing a guidebook, and I understand that reading the guidebook can be helpful, I've come to expect Great Courses to be presented in a way that does not rely on the guidebook or recommended readings. 2. The course lacks sufficient chronology. The course is mostly topical and sometimes jumps back and forth through the 19th century to the point of confusion without providing sufficient detail. Again, I do not want to be too harsh in my review. The Great Courses almost always produces an enjoyable and informative product. This course meets the minimum threshold of quality. However, the structural deficiencies makes this course less stellar as I have come to expect. Darn good course and I have an MA in the subject. I am still a little fuzzy about the Bismarck alliance system but who isn't? I am 67 years old but I wish I could be an undergraduate again and take these courses. This course puts me back in the classroom. I think the four stars are more because of how interesting and complex the topic is, rather than for the actual analysis. I feel I know a bit more, indeed, and it's hard to make sense of such a complex set of circumstances all over the place. I could have done without the side remarks (no, I'm not impressed at Prof. Weiner's having spent New Year's Eve in Berlin once, or by how he and his wife once saw a rally in Paris. Seriously?) and without the over-emphasizing of half the words in a sentence and without him telling us how professional the people at the TC are. I guess I'm more of a barebones kind of reader. 18 sur 24 personne(s) ont trouvé cet avis utile. There is a lot of history to cover in 120 years and the focus on themes rather than a narrative was very insightful and interesting! The professor gets distracted often, and you can feel it. He will start making longer and longer pauses between words, and then just make a mistake (the wrong country name for example), and then correct himself, and eventually you hear him rally and get his line if thought back. This is a very good summary of the period between the French Revolution and WW1, but it assumes that you've already studied all the separate parts. For example, it will not give you the story of the Crimean war, it will tell you of the events and processes lreading to it, and the impact it had, which lead to another thing which you're also supposed to already know about. So if, like me, you're looking to fill an education gap, because your high school education didn't cover the 19-th century properly, then this is not exactly the course that will do it. Although it might give you a good list of the significant things that you need to reserch further. Much too slow, much too simple. The speed of speaking isn't thoughtfully slow, but rather sounds like he adds unnatural pauses in between words in case his audience is trying to write everything down. The amount of information included in each sentence is , to the point where it sounds like he's just trying to fill up time by putting in filler sentences that restate the obvious. I can only guess that he's trying to make the lectures as simple as possible, but nothing for adults is ever this simplistic. Average middle school students (and probably younger children) would find this easy. I've listened to perhaps ten "Great Courses" audiobooks, and have never found it so hard to keep going. Right now I'm at lecture four and feel like every minute has been a waste of my time. Don't know how long I'll keep listening. Hörbuch zurückgegeben. Als Überblick wenig sinnvoll - vielleicht anekdotenhaft für jemanden interessant, dem ein neuer Forschungsstand und eine objektive Darstellung egal sind. Aber dann muss man sich das überhaupt nicht anhören. Ich wollte es als Wiederholung für das Staatsexamen Geschichte anhören und dafür war es ungeeignet. Der Sprecher hat mir nicht gefallen, er hatte eine für mich nervige Intonation und eine eigenartige Art, einzelne Wörter zu betonen, lauter auszusprechen und Pausen zu machen. Schade! Rückgabe hat aber auch noch nach ein paar Wochen problemlos funktioniert!